This new series features R.A. Salvatore's signature character, Drizzt Doourden, as the focal point of the entire trilogy. The popularity of this signature character has driven Salvatore's last seven hardcover titles to New York Times bestselling status. It’s been a long time since Drizzt Do’Urden has had to fight alone. When a ravaging mob of vicious orcs overruns the North and his friends are washed away in its evil tide, he must take matters into his own deadly hands. An all-new trilogy takes Drizzt to the edge . . . and beyond. 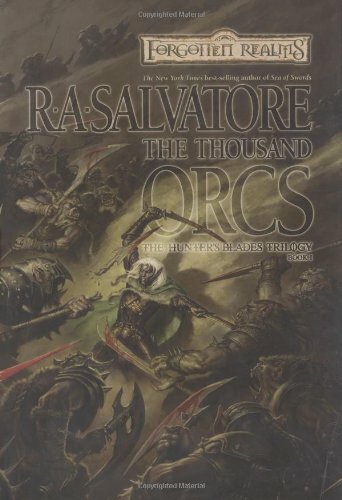 The Thousand Orcs opens a new trilogy starring R.A. Salvatore's popular dark elf Drizzt Do'Urden and his loyal friends Wulfgar, Catti-Brie, Bruenor, and Regis. The band returns from Icewind Dale in the company of the dwarves of Mithril Hall, who are escorting King Bruenor back to reluctantly assume his throne. But, as always, old enemies and new emerge from the shadows to threaten our heroes. Emboldened by a dark alliance with the deadly frost giants, an orcish horde is massing quietly, waiting with uncharacteristic patience to move against dwarves, elves, and humans alike. Meanwhile, Bruenor, sensing that his adventures will come to an end once he takes the throne, coaxes his friends back onto the road, all the while unaware of the powerful forces gathering strength by the roadside.